Joy Creek Photo Archive (c) all rights reserved The species is commonly called laurustinus because of the resemblance of the foliage to laurel leaves. 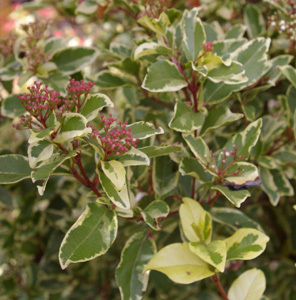 This variegated form has glossy evergreen foliage attractively, if irregularly, margined in creamy yellow. Sometimes the central green area has gray green or pale green patches. The early spring buds of Viburnum tinus 'Variegatum' are reddish opening to fragrant white flowers. Late winter and spring. 7-8 ft. x 5 ft.